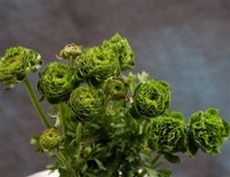 Ranunculus - Green Ranunculus is known for its many colorful petals. A single bloom averages dozen of petals, in many bright colors. Wholesale bulk ranunculus flowers are perfect for wedding bouquets, table centerpiece or flower arrangement. Free Shipping!